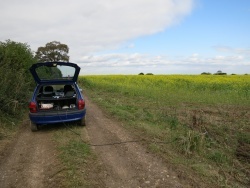 I launched my CRAAG1 Pico HAB payload on 10th October 2012. One 36" Qualatex foil balloon was used for lift. 15g of free lift was planned, giving it a high probability of burst (and me getting my payload back). Due to rushing however, the balloon was overfilled by 2 or 3 grams. 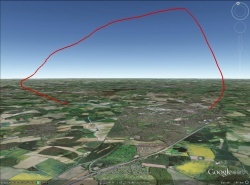 The flight was simulated with the CUSF Predictor just 10 minutes before launch, and the prediction was for a landing several miles north of Basingstoke (Screenshot). However once it had a payload in it's grasp, the weather had different ideas. Launched: Woodgarston Farm nr. Basingstoke at 12:41 BST (11:41 UTC). Landed: Safely in Old Canal Place, Basingstoke at approximately 13:45 BST (12:45 UTC). 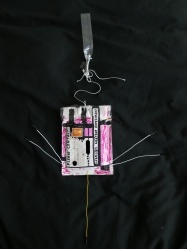 Photo of landed payload. 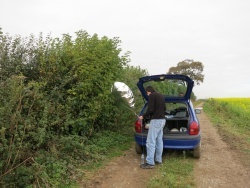 The range of the Radio Telemetry from the payload was very impressive, with the Southampton University ASTRA station picking up the transmission almost immediately after launch, closely followed by a station in Milton Keynes. Checking the telemetry before launch. Tracking the balloon from the launch site. Reason for the 6.7m/s descent, not much to slow it! 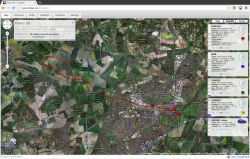 KML Data in Google Earth, showing Flight Path over Basingstoke. 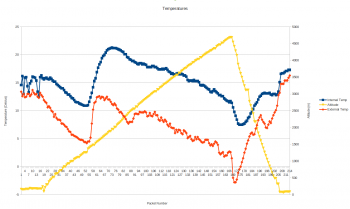 Complete Telemetry in a CSV file. GPS Data in a KMZ (Compressed KML) file. 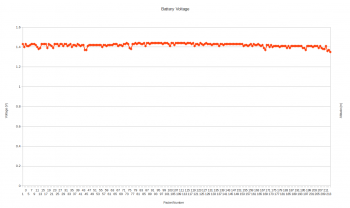 The short flight has almost no impact on the Battery Voltage. The dips will be when the GPS had to enter Acquisition mode due to losing lock. This page was last modified on 1 October 2014, at 10:21.